Satsuki returns to the Honnouji Academy, she prepares the students for the arrival of her mother Kiryuuin Ragyou. 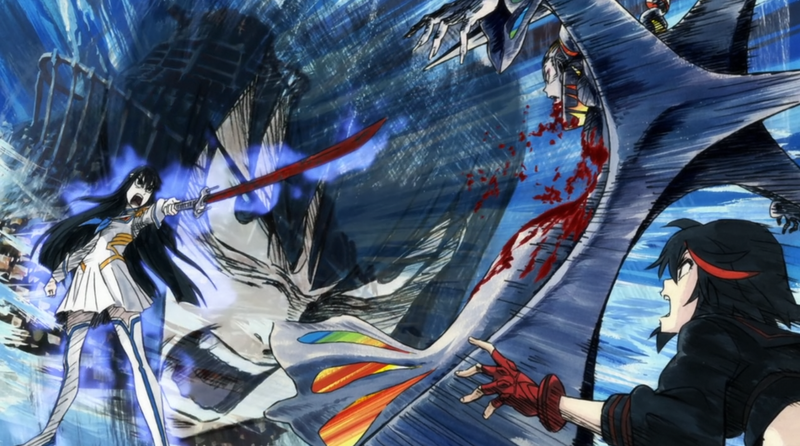 Mako and Sengetsu prevent a fight between Ryuko and Tsumugu. Sengetsu and Ryuko have a discussion about the Life Fibers. Ryuko reveals that she feared the potential responsibility that weights on her. Aikuro appears and explains to Ryuko how Tsumugu sister came to die. He explains that her father made improvements to the Godrobe, by splicing it’s Life Fibers with her central nervous system’s DNA. 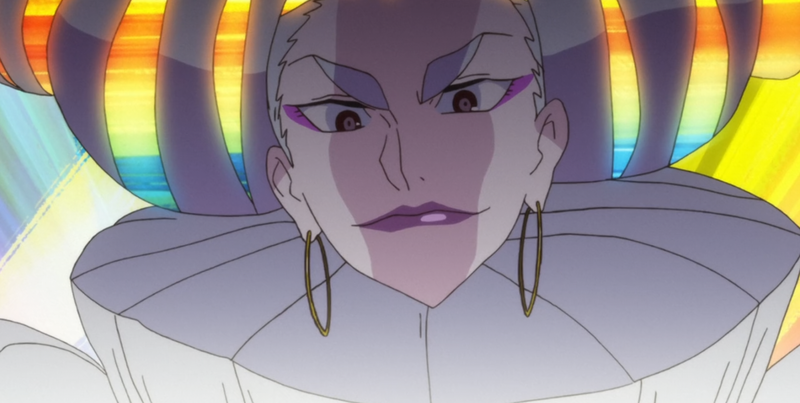 While spying on Honnouji Academy Aikuro explains that it’s a “ground for a large – scale experiment”. The goal is to test the students resistance to the Life Fibers, and allow them to consume their human host. Aikuro and Tsumugu prepare for battle. Aikuro introduces “A Tailor’s Dagger and Tailors Glove” to Tsumugu. These weapons are capable of cutting Life Fibers. At the academy, the four Devas prepare for the grand festival. Satsuki toasts to their achievements, the following day the festival begins. Kiryuuin proclaims that she will ” carry out “, the will of the Life Fibers. She then presses a button and the Life Fibers begin to consume their hosts. 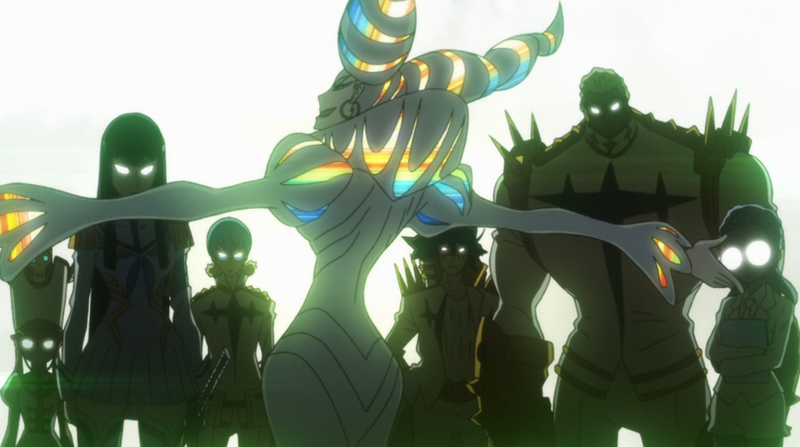 Aikuro, Ryuko and Tsumugu use a DTR to enter the stadium and face-off against Kiryuuin and the others. 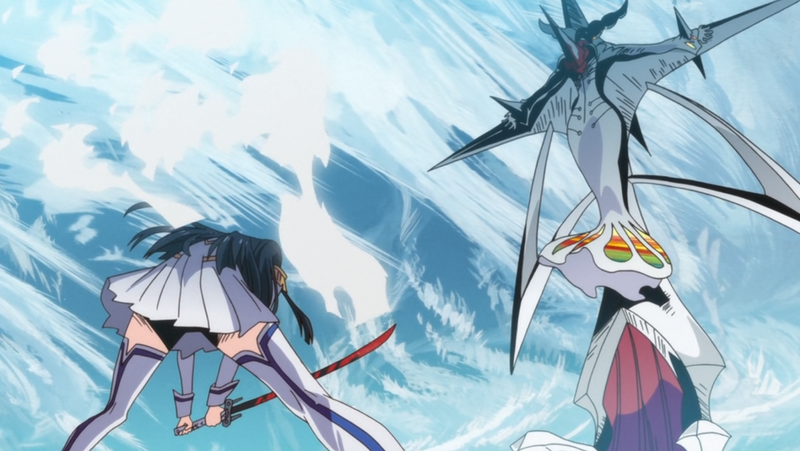 As Kiryuuin talks with Ryuko, Satsuki stabs her mother through the chests. Satsuki declares rebellion claiming that she plan to defeat her mother all along.